Mix together all “fruit” ingredients. 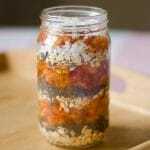 Measure out all ingredients then layer into a glass jar or bowl a scoop of the oats and chia seeds, a dash of milk, a spoonful of fruit, and a sprinkle of walnuts and coconut. Repeat until you’ve used everything.